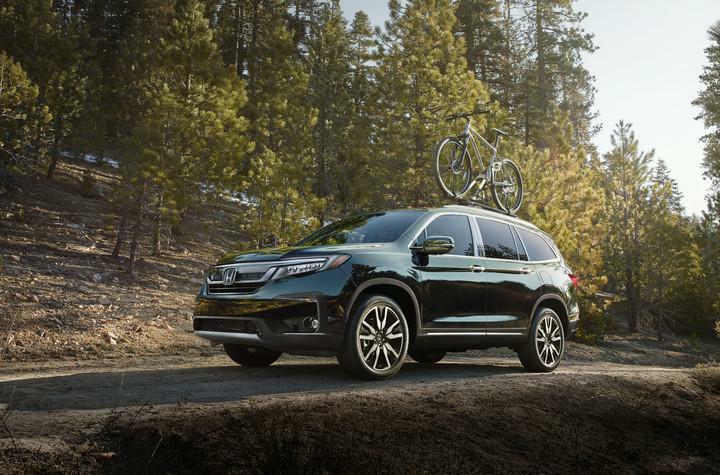 Gone forever is the boxy shape of the original Honda Pilot and in its place is the freshly-updated 2019 Pilot, with more aggressive, contemporary exterior styling that’s certain to make heads turn. The restyled 2019 Honda Pilot features a bold new front fascia with standard LED low-beam headlights, while rear styling features new taillights, a new bumper, and chrome accents. The long list of upgrades aren’t limited to the exterior of the eight-passenger 2019 Honda Pilot SUV which include new Display Audio systems with a physical volume knob, for easier access as you drive, along with Apple CarPlay and Android Auto integration available in select trim levels. Best of all, there’s every trim level of the 2019 Honda Pilot for sale in Sacramento at Mel Rapton Honda. The many upgrades reinforce the new Honda Pilot's fundamental capabilities while advancing the state-of-the-art technology and family-friendly character that has made it one of the most popular midsize three-row SUVs. Pilot also remains one of the few models in the segment to offer eight-passenger seating. This family-friendly characteristic has made the Honda Pilot one of the most popular midsize three-row SUVs on the market. The Pilot also remains one of the few models in its segment to offer eight seats (seven-seats if you opt for the second-row Captain's Chairs), with three-person capacity in both the second and third-rows, and with third-row access made simple and easy by the available One-Touch Walk-In feature. Access from the rear of the Pilot has been improved as well with a hands-free power tailgate is available for the first time on Pilot on Touring and Elite grades. With the remote key fob in their pocket or handbag, the driver simply kicks their foot under a designated area of the rear bumper to fully open the rear hatch. For the driver, a newly redesigned instrument cluster features a new, larger thin-film transistor (TFT) screen with a variety of user-selectable displays such as audio system information, a detailed trip computer, phone information, and turn-by-turn route guidance on Pilot models equipped with navigation. Pilot's all-new Display Audio system is standard in Pilot EX trims and above, its eight-inch touchscreen uses gestures such as swipe, tap and pinch that are familiar to smartphone and tablet users, to control the vehicle's audio system, display settings and other advanced features. Shortcuts for commonly used features and customizable app locations are easily added. The new Display Audio includes AM/FM, HD Radio, SiriusXM, Apple CarPlay and Android Auto integration, along with HondaLink in Touring and Elite trims. In addition, Pilot models with the new, larger 10.2” Rear Entertainment System (RES) can play CDs in the same drive that plays DVDs and Blu-ray media. Pilot LX, EX, and EX-L models get a 218-watt audio system with six speakers plus a subwoofer. Touring and Elite models get an updated 10-speaker system plus a subwoofer pumping out a total of 590 watts of power. CabinTalk is included on Pilot EX-L models with navigation and rear-seat entertainment, Touring and Elite trims. Using the HandsFreeLink microphone, it allows those in the front-row to easily communicate to those in the second and third-rows using the rear speakers, wireless headphones, or both. For 2019, all Pilot models come standard with the Honda Sensing suite of advanced safety and driver-assistive technologies. Honda Sensing provides the driver additional information about the conditions around the vehicle, and in some cases helps drivers maintain lane position. Comprising the Honda Sensing suite are Collision Mitigation Braking System (CMBS) with Forward Collision Warning, Road Departure Mitigation (RDM), Lane Keeping Assist System (LKAS), and Adaptive Cruise Control (ACC). Honda's blind spot information system (BSI), previously available only on the Elite trim, is now standard on EX, EX-L and Touring trims as well. Additionally, Rear Cross Traffic Monitor has been expanded from the Touring and Elite trims to EX and EX-L. In addition to the above, Pilot offers numerous other driver-assistive features, such as automatic high beams and a Multi-Angle Rearview Camera, both standard on all trims. Other standard safety features include an advanced four-channel ABS system with Electronic Brake Distribution, Brake Assist, advanced front air bags, front side airbags, and three-row curtain airbags with rollover sensor. Given the limited space, there’s not enough room to go through all the new standard and available features on the 2019 Honda Pilot, including 4G LTE Wi-Fi, Wireless Smartphone Charging, the cabin Control app, the available AWD system with i-VTM4 among others. The best opportunity to learn all about the 2019 Honda Pilot is to stop by Mel Rapton Honda and allowing their product experts to walk you through the features that interest you and your family the most. Then we’ll send you out on a test drive which we guarantee you’ll return from with smiling faces.